So, with the 16/17 regular season having just come to an end, i figured I'd get a start on some jersey concepts for the highlights of the 17/18 season, the outdoor games. I'm not sure how long it'll take me to complete them, but I will finish all 8 teams before the season starts. So without further ado, here's my first team of the NHL 100 Classic, the Ottawa Senators! It's a solid design, but if you're going to have just one stripe on the socks and arms, it should be the same on the chest. 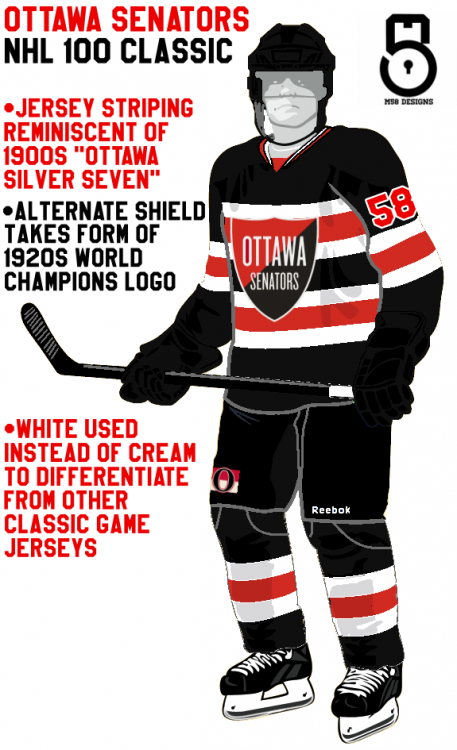 Curious to hear any other thoughts on the Sens? The double striping improves it all. I'd like to see some more teams, though. Great, thanks! Canadiens should be up relatively soon.